Historical records state that Billy Mathews was the first Canadian to win the Daytona 200 in 1941 but he wasn’t the first Canadian to win a National American event. 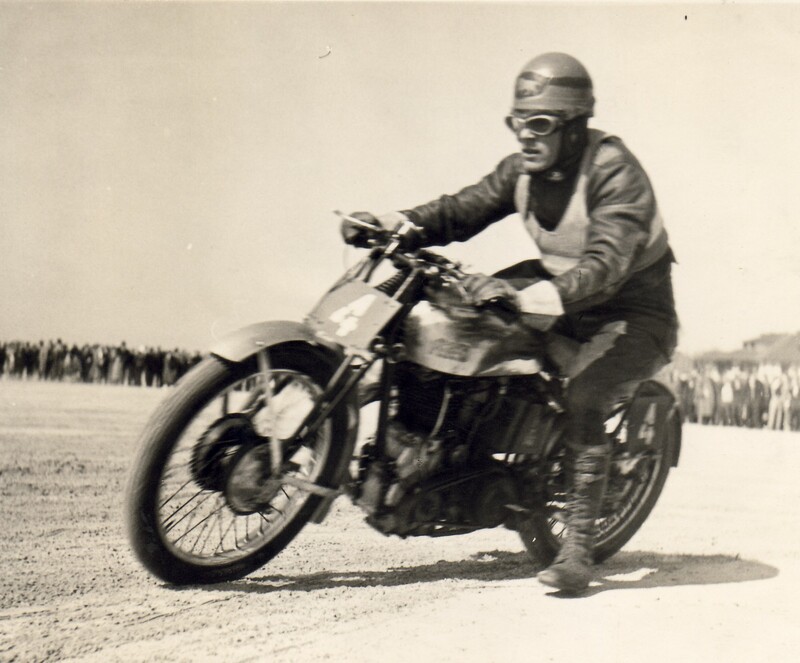 That honour goes to Bob Sparks who in 1939 won the Langhorne, Pennsylvania 100 mile dirt track race on a Norton and became the first Canadian to win an American National Championship and the first on a non American motorcycle. Langhorne was notoriously known as the most dangerous dirt track in America. Bob had ridden hard at Langhorne for several years, in the money, but never quite realized that burning ambition to win the National title. In 1939, he went into 1st place on the 4th lap passing Kretz, Campanale and Beatty and by the 65 mile mark, lapped the entire field, finishing with an average speed of 82.8 MPH. Bryan also competed at Langhorne and in 1938 finished 3rd. Bob Sparks and his brother Bryan grew up in Windsor and were members of the Windsor Motorcycle Club in the ‘30s. It was nothing for them to come all the way to Streetsville for a race; Bob riding a 250 BSA and Bryan accompanying “Ma” in the family flivver. The familiar phrase “the Sparks boys are here” was heard at many events in Ontario and the USA and they were well known riding a 350cc overhead cam Velocette. The brothers both rode in the 200 mile Belleville street race in 1936. Robert on a 350cc Rudge was running third for most of the race but finished 7th; Bryan on the Velocette finished further back. The Windsor Motorcycle Club sent a team made up of Elwood Stillwell, C.J. Carroll and Bryan Sparks to Daytona in 1937. But it was in 1939, just before the outbreak of World War II, that the Sparks brothers had their greatest racing achievement. In the January, 1939 Daytona 200-mile National Championship race, Bryan Sparks placed a close fourth on his 500 Vincent, riding against the American bikes that were allowed a 50 per cent greater engine size. Bob tried his hand at the cinder tracks in England in 1938 as part of the Canadian Speedway team. Unfortunately he was also involved in an accident. Spencer Stratton was killed in a head-on collision between two cars and the three Canadian riders travelling with Stratton, were seriously injured; Ellwood Stillwell, Bruce Venier and Robert Sparks. The injured men were taken to hospital with severe head and face wounds; all recovered without any lasting injuries. Bob returned from England in 1939 with a pretty hot Norton with which he won Langhorne. When BEMC started holding races along the shores of Georgian Bay at Wasaga Beach in 1935, both brothers competed regularly and quite successfully marking record speeds in the sprints and placing in the top five in races held there up to and including 1940. Bob won nearly every dirt track race in Canada in 1939 and set a new American ½ mile record at Columbus, Ohio winning the 10 mile Expert Feature after clocking a 29.39 seconds lap in time trials to set a new Class “C” record. At the outbreak of war, Bryan enlisted in the RCAF, won his pilot’s wings and served several years as a pilot instructor. Later he was sent to India and there he contracted polio and died just prior to the defeat of Japan. Canadian motorcyclists everywhere shared with his family in the loss of a grand sportsman. Bob continued to run in Half Mile Races with wins at Oshawa and Norwich among many others. He had competed at Napanee since it started in 1945 and was very popular with the fans. At the Labour Day races in 1947, he took a first in the 3 mile and 5 mile event on the Velo, pleasing the fans. Ted Whitney reported in the CMA News in June 1948 that Bob Sparks of Toronto has the fastest clutch starts we have ever seen. When BEMC opened the track at Edenvale in 1950, Bob was there riding the Jordan Special and took the win in the airport road race. Bob was an active Jehovah’s Witness and passed away in Windsor well into his 90’s. 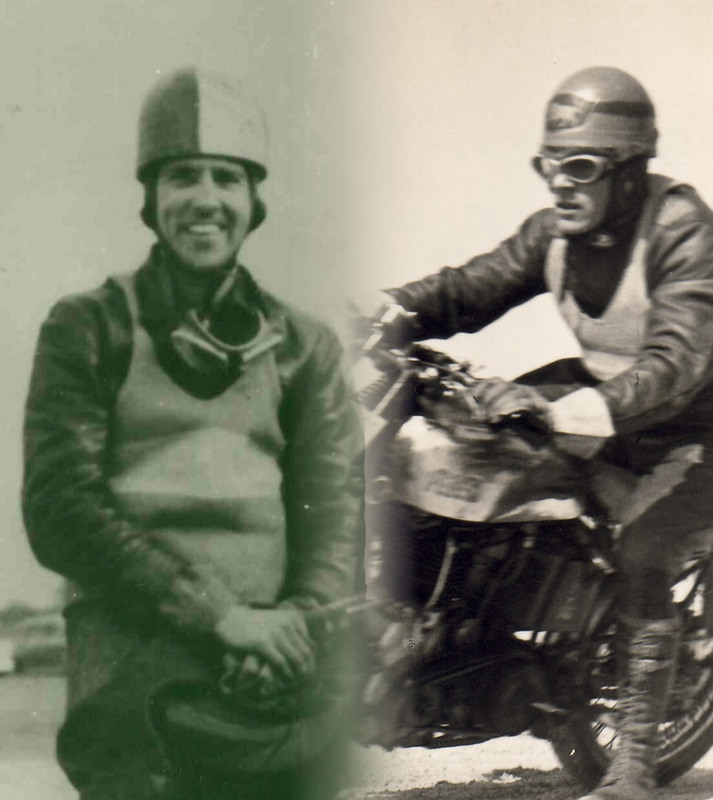 The records going back to the 30’s and 40’s are scarce but there is no doubt from what is available that both Bryan and Robert were accomplished competitors and worthy of being recognized in the Canadian Motorcycle Hall of Fame.